Coloring mortar accurately and consistently is only achieved by preblending all mortar constituents and pigments using computer batching systems, while adhering to a specialized process. Over 20 years ago the SPEC MIX organization introduced this technological approach for colored masonry mortars to the construction industry, and it continues to perfect this process. SPEC MIX colored mortar uniformity starts with sourcing high quality, stable pigments that are pre-weighed to ensure the colorant loading meets each specific formulation for our standard and custom colored mortars. Then all the ingredients are weighed and preblended to achieve a homogeneous mixture. 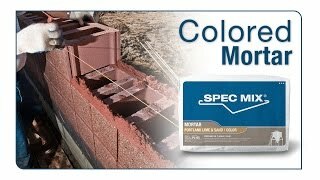 The SPEC MIX standard colored mortar line is a collection of 25 colors that are available in 80 lb. and 3,000 lb. bulk bags throughout North America. And when building owners and designers want a unique color that supports their vision for a project, the options for custom SPEC MIX colored mortars are endless and consistent from batch to batch. * The sample colors shown in color charts or channel kits are provided to demonstrate the colors available. THE SAMPLE COLORS ARE ONLY APPROXIMATE. Variation in color, shades of color, texture, and aggregate exposure is inherent in all masonry mortars and exact matches cannot be guaranteed. Actual shade and texture will depend on job site conditions, lighting, mixing and installation techniques and types of masonry units used, and may vary from color charts or color channel kits. It is recommended that a sample panel is constructed using all representative materials and allowed to fully cure. The panel should be washed and approved prior to construction. The beauty of masonry is that it can be designed and built as a customized system offering endless options to compliment most any architectural vision. The unique SPEC MIX custom colored mortar selection process supports this vision with the ability to produce nearly any color imaginable to achieve the complete masonry appearance desired. The SPEC MIX team of product specialists located throughout North America are experienced at working with project owners and designers to create special colored mortar formulations. Whether it’s matching mortars from existing buildings to picking colors from a spectrum of options, we deliver uniform, consistent colored mortar from project start to finish. To start the process of SPEC MIX custom color matching, contact your local SPEC MIX representative today.